When the Giving is Girl-Powered! 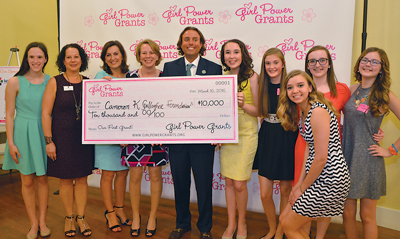 A few of the leadership team members of Girl Power Grants include (left to right) Maggie McKenna of Henrico, Madison Anonick of Chesterfield, Morgan Rhudy of Chesterfield, and Delaney Baratka of Hanover. Morgan Rhudy knows how simple multiplication can transform a community. She’s doing just that with her nonprofit. Morgan, a freshman in James River High School’s Center for Leadership and International Relations, and dozens of area teens in grades six through twelve are members of the 2-year-old nonprofit, which last month awarded its second annual grant. The finalists for this year’s grant included Gracie’s Gowns, which distributes personalized hospital gowns to children, Stay Strong Virginia, which raises awareness of eating disorders, and YoungLives Metro Richmond, which addresses teen pregnancy. At a ceremony just before press time, YoungLives Metro was named this year’s grant recipient. Members of Girl Power Grants celebrate with the 2017 grant recipient, YoungLives Metro Richmond. GPG is a giving circle, which means that members pool money to fund one large grant. Each member gets one vote toward the annual recipient. 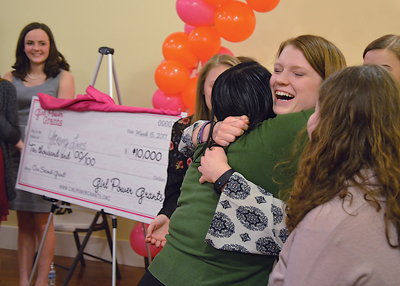 The GPG concept is modeled after Richmond’s Impact 100 (a women’s giving circle that gives out two $100,000 grants a year), founded by the mom of one of GPG’s founding members, Delaney Baratka. While giving circles are popular throughout the country, ones founded and run by teenagers are rare. GPG members learn about many area nonprofits each year, according to Morgan. They kick off the giving season with The Big Learn, a day in November when members research and present information on a variety of organizations. From there, she said, the members vote to invite some nonprofits to apply for the grant. (Other nonprofits are eligible to apply for the grant as well, even if not formally invited). What are they looking for in a nonprofit? “I look for an organization that has an impact in our home community and that is impacting teens’ lives dynamically, not just monetarily… [an organization] that would use our money to build or grow a project, especially one that GPG could help out with or be involved in,” explained Abigail McAllister, a student at Veritas School and member of GPG. Cameron K. Gallagher Foundation was awarded GPG’s inaugural grant at a ceremony last year. In 2016, GPG received sixteen applications from Richmond-area nonprofits and narrowed the field to three: Connor’s Heroes, The Friendship Circle, and the Cameron K. Gallagher Foundation. On the night of The Big Give, as it’s known, representatives from the three organizations presented information about their causes, then GPG members voted live. The inaugural grant went to the Cameron K. Gallagher Foundation, which offers education and resources for teenagers battling depression. Its namesake was a Douglas Freeman High School student who died of an undiagnosed heart condition in 2014 after completing the Shamrock Half Marathon. Cameron struggled with anxiety and depression, and her dream had been to organize a 5k race to draw awareness to mental wellness. The Foundation has presented the SpeakUp 5k for the past three years. The GPG gift was used to develop peer support curriculum which provides mental health education to middle and high school teens, parents, teachers, and school administrators. Cameron K. Gallagher Foundation CEO Grace Gallagher says she was amazed at how GPG members wanted to be hands-on. “Honestly, I’m blown away that these girls at their young age would see the importance of being in this together and feel a sense of responsibility to give back to the community. 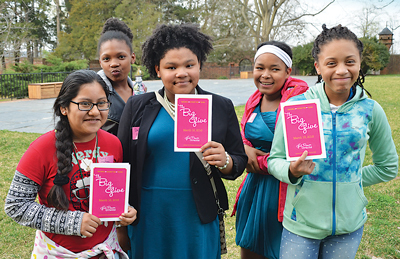 Girls from Higher Achievement joined Girl Power Grants during its first year through a unique scholarship program and participated in the voting for The Big Give during 2016. Studies have shown that children and adolescents who do community service learn the control and assurance needed to build their sense of self-worth. In addition, evidence shows that young people who volunteer and raise funds learn life skills, responsibility, and commitment, as well as improve their grades and behavior in school. Morgan’s mother, Michele Rhudy, also a founding member of Impact 100, agrees. “They’re talking about things that are hard – teenage pregnancy and eating disorders – and they’re sharing their own life experiences. Last year, with the Cameron K. Gallagher Foundation, that hit a nerve. Every girl there knew somebody dealing with mental health issues. But commitment to GPG isn’t overwhelming, members say. “One of the main things I tell my friends is how easy it is to have an impact through Girl Power Grants. It can be such a small time commitment, but as a group we have the power to donate our money and time to organizations that we care about. It’s rewarding and it’s just fun. 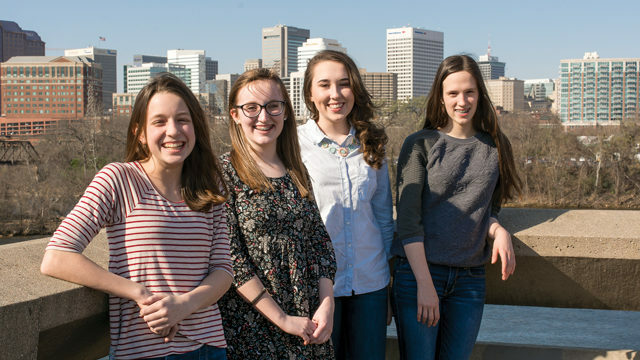 It’s an amazing group of girls, and everything we do is a great experience,” said Maggie. In addition to the membership fee of $100, which goes to support the grant, there also are annual dues of $15, except for those who take part in GPG’s Ambassador program, recruiting and leading mini-chapters. It was fitting that the first grant awarded by GPG went to the Cameron K. Gallagher Foundation. Working with GPG has helped the Gallagher family heal from Cameron’s death and fulfill some of their teenage daughter’s dreams, said Grace Gallagher. “When I look at them, and I know where Cameron was at their age and what she felt like inside, and to know that a group of girls her age wanted to give back, that’s exactly what Cameron wanted to do. She wanted to do something with her struggle that was meaningful. In two short years, the group has made a difference by empowering teenagers and reaching out to support other nonprofits. “These organizations are going to be a big part of our life story. And it’s been life-changing so far,” said Morgan. Lisa Crutchfield is a freelance writer who lives in the West End with her family. She has a daughter in college. Lisa writes about anything and everything for RFM.